I just love planning a menu every week, I have done it for so many years it is just a part of what I do as a home manager. I have a special little journal that I put my menus in every month and then at the end of the year, I have a record of what we did every month.I try to plan a week of two at a time and sometimes a whole month. It really does save time and money, and allows me to plan left overs. Sometimes if I sit with no idea what to plan I can just page back through some of my old menus and get some great idea's and now of course there is the blog index for What's For Dinner Next Week Menu's Tab at the top of the blog. As of this post we have a completed one year of weekly menus. So now lets take a look at this weeks menu. I hope that you are taking the time to save time and money with your weekly menus. Thank you so much for stopping by to spend time with me today and I hope to see you soon at Full Plate Thursday! 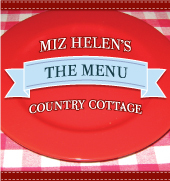 Miz Helen, My mouth is watering from your menu. Everything looks so good. Not only do I love your place, but I absolutely adore this idea of having everybody to get together and pitch in with their dishes! !Feels a picnic every week:)Thanks so much! thanks for sharing this idea I try to plan menus ,but it takes some skill and you make this look so easy. As usual I am hungry by the time I finish reading! I am so impressed with your meal-planning management skills. I can't imagine having an entire year's worth of menus all planned out, but I really do like that idea. You should post some of the actual pages, I love looking at other people's food notes. Looks like a week of wonderful food! I will be right over. Come visit us today. We have a great tomato pie recipe. Congrats on a year of weekly menus!! What an accomplishment and amazing service. I am grateful to you for all I've learned about menu planning. Miz Helen, as always, your menu sounds wonderful! What an inspiration you are!!! Miz Helen, you're going to have a very yummy week. I'm copying your spoon bread and sweet potato recipes for future use, they both look delish. Thank you for taking the time to visit me, I hope we run into each other next week at Stone Gable. You are so organized, and all set for the week's menu. Love the sweet potato salad, and would love to try it! Thank you so much for your kind concern and care about my unfortunate piched nerve. I am much better now, finally after almost one week. I think your menu for the week sounds scrumptious! I wish I could plan for the week like that, it would certainly make my life so much easier come supper time each night! Wow that looks like a great week! I'm a new follower!